NOTE: a vigil will be held at St. Vincent de Paul Downtown Chapel on Wed., March 31st at 2 pm — to remember all who have died on Portland’s streets this winter. UPDATE: Six long cold rainy months have passed since City Commissioner Nick Fish promised the Oregon Law Center, an Oregonian reporter, the homeless people of Portland, and their allies (for the umpteenth time) that he would modify the City’s strict (and clearly un-constitutional) camping ban. His Office has had a succession of excuses, each of them either untrue or truth mixed with lies. Commissioner Fish is in charge of the “Ten Year Plan to End Homelessness,” so of course many believe him when he promises to do something. But this is ongoing injustice. This is justice delayed and thus denied — on a systematic, ongoing basis — for thousands suffering outside. This depriving of poor people of their rights — to simply sleep in a dry tent or under a tarp, and to just be left alone (even when in out-of-the way places, doing no harm), and to be free from unreasonable seizure of their only possessions by police — is constitutionally and morally WRONG. Nick Fish is an attorney who knows all about civil rights. Mr. Fish knows better. This delay in modifying the camping ban speaks volumes about which side of the civil rights struggle he’s working for. These ongoing injustices are being permitted day and night by City Council leaders who don’t care enough to have stopped it by now. Perhaps a dozen people have died waiting for the simple right to put a tarp or tent over their heads so they can sleep. Hundreds more have suffered the onset of mental illness for the first time, because of the ongoing sleeplessness and fear which accompanies their homelessness — in a town where police treat them like dogs. Our homeless friend George grew up in Portland. He died during that record cold weather of December. George was never one to ask for anything. He reported that police had taken his tent in late November, but said he was getting another. Our friend George died near the Lloyd Center during that week-long, terrible cold spell here in December. He often refused to go to a shelter because, he would say, “If I really hussle and do get in there, that leaves someone else out.” In Portland today, a thousand more shivering people are still alive, without any shelter — tired, and waiting. Without options, still forced to sleep outside, they are afraid of the Portland Police. Ask any homeless person you see whether they aren’t afraid or very cautious. It’s a tiny minority of the homeless who have “chosen” that kind of life these days. Thugs often harass the homeless when police don’t. One homeless man was murdered not far from Fred Meyer’s at 30th & Weidler in late January. Worst of all, the homeless are afraid of police harassment. So many have lost their possessions in sweeps. The Portland Police have used every excuse to throw out the supposedly helpful “gentleperson’s agreement” worked out to appease the Oregon Law Center. They nightly make their rounds harassing poor people who have no options (knowing these folks can’t afford lawyers). When homeless people are awakened, they sometimes try to sit, awake, on out-of-the-way parts of the sidewalks. The then police consistently lie, saying that they are in the way (when clearly often not), or else the Police say that violence or drugs were happening. We have filmed sweeps where there were clearly no violations of law happening (not even by the new ADA standard re/ sidewalks), yet this is consistently in the reports of police the reason for the forcing people off of sidewalks. We have seen and filmed this over-reach, these violations of the City’s new ‘Sidewalk Management Plan.’ Most people in Portland know that bullying is rampant among Police here. The City Council is enabling these unconstitutional abuses through their omissions. And Nick Fish in particular is responsible for the ongoing suffering and some deaths of thousands of homeless people for his having dragged his feet and avoided modifying the camping ban — all the while showing the most professional courtesy to the Oregon Law Center and the Court where the City is being sued for its cruelty. Sleeping "legally" in Irvington, this man is not blocking the sidewalk, and not covering himself with a tarp, tent or other covering. The police came and told him he had to leave anyway. Maybe next week they will offer a settled modification of the ban. At that point, the set of problems outlined in the November Archive will need to be discussed. Please be prepared to go to City Council when the camping issue comes up, and advocate for all of the homeless people who will not be given permission to camp on private property! MOST will likely not be given such permission. Fish will be proposing a ‘night time only’ camping privilege — from 9 pm to 7 am, REGARDLESS OF WEATHER. This is foolishness. If Portland Police enforced the letter of the new law (and you know they will), then that means people will get wet every morning at 7 AM when forced to pack up and move. Move where?! There are not enough day warming centers either. There is not enough space in the libraries, or under the eves at Goodwill… These people will get wet, and they will stay wet. They will remain tired and often get sick and sometimes commit crimes of desperation. Note: the City Auditor’s Office updates the Agenda each Friday for the upcoming week, so there is a good ‘heads up’ time. By the way – it is NOT true what Commissioner Fish keeps saying to justify the delay. Just because a law is under suit, and the City in settlement negotiations, does NOT mean that they can not modify the camping ban in the meantime. They are looking for a way to loosen the ban as little as possible, is all, and want to know exactly how much the judge in the Anderson case might require before they act. Is it in the public interest to rationally de-criminalize camping in Portland, so that thousands of un-sheltered people locally don’t have to sleep out in the rain? Should people be allowed to camp in plain view, rather than have to find places to hide in order to avoid being randomly roused by police or thugs at 3 a.m.? Should official shelter spaces (with services) be freed up to serve more vulnerable people, while healthier adults are allowed to pitch tents out-of-doors? Yes. We believe that this is clearly in the public interest. Wouldn't it be better to designate appropriate, legal camping places? In the coming days, the Portland City Council will be asked by Commissioner Nick Fish to consider allowing some camping in Portland. Camping will be allowed only according to guidelines defining proper conduct, places, and times. How the Council will vote is yet undetermined. We believe that they are under pressure from dull and insensitive elements within the Portland Police Bureau to oppose any significant easing of the camping ban. The powerful Portland Business Alliance has also been consistently opposed to any kind of visible poverty (and thus camping) as this might tarnish the image of our nice clean city. Thus this unconscionable delay. There are links, facts, and figures throughout this Post. We hope to raise public awareness about this camping issue, and homelessness generally. We want to urge you to contact Nick Fish and the rest of the City Council. We hope that you will feel moved to tell them that you want to see more effective measures taken to help the un-sheltered. We hope that you will insist to each member of the City Council that it is in the public interest to support an easing of the camping ban. You might also ask that they support development of local work and education programs which would help those currently homeless toward self support. Contact information for our Council members are at the bottom of this Post. Some Facts: at least 10,000 People Are Now Consistently Sleeping Out-of-Doors in the Metro Area. Oregon has the highest percentage of homeless citizens of all fifty states. Worse, ours is one of only a small number of states where the majority of our homeless citizens are without any shelter. The camping ban works to ensure this. Local officials are constantly quoting smaller numbers, while pointing to all their successes. Portland has its boundaries and Gresham has their’s. It’s easy to NOT count people who refuse to respond to surveys or who remain hidden. The numbers of those who are consistently without shelter locally easily add up to over 10,000 by now. At least twice that number, perhaps 20,000 more, have only temporary housing. Many of those temporarily housed are in high stress, unhealthy situations. The homeless population is different now than it was two years ago. Unemployment and under-employment have made for a huge increase. There are about a quarter million unemployed Oregonians, with more than half of these in the Metro area. where's better? here or in a field with a tent? This approach — focusing primarily on the chronically homeless — is outdated in today’s economy. It is very costly, and yet is only able to help a fraction of the fast growing homeless population. Most of those experiencing homelessness today are not ‘chronically’ prone to homelessness, but rather are high functioning, working class, and relatively newly homeless. Most of the Portland area homeless today are either not qualified for housing assistance or are on two to three-year-long waiting lists. Our emergency shelters are already full. Hundreds are being turned away nightly. Many don’t even bother trying to check in any more at the shelters. Hundreds are sleeping in their cars, but among them, many are unable to renew expired tags or pay for insurance, or for gas. The streets, a last resort, is all that’s left for many. Most of today’s homeless do their best to stay hidden in order to keep their possessions safe, and/or to sleep without fear of harassment by police or thugs. Hiding in order to sleep can be dangerous though, especially for women. For many it makes for increased despair. This strict camping ban is bad for public health and public safety. What is left for those stuck without options in the rain? Pitching a tent or a tarp or a piece of cardboard in an out-of-the-way spot to avoid the rain and cold? Nope – sorry! 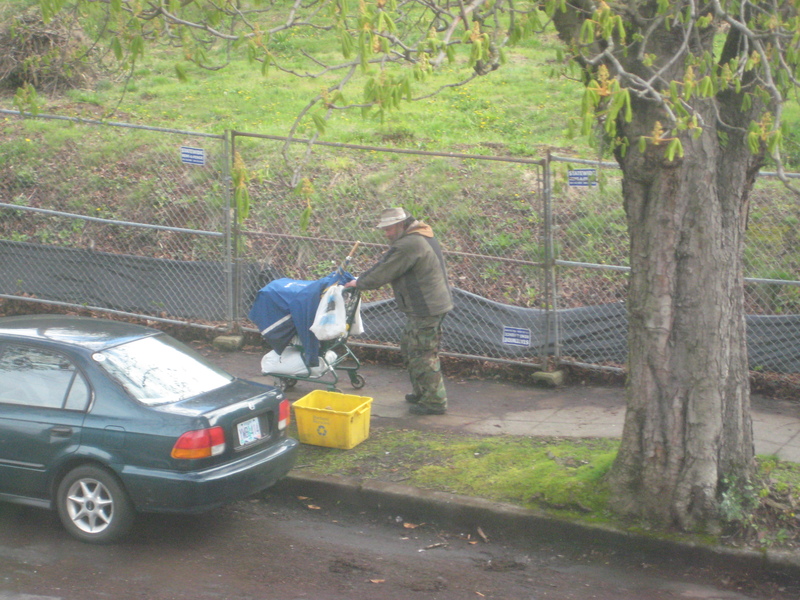 Pitching a tent is illegal in Portland, Oregon, U.S.A. The same kind of anti-camping (anti-sleeping) laws are in place in cities across this country as well, especially in the ‘red’ states. What’s especially terrible about this – is that most homeless people locally don’t know where to find food outside the City. So they feel they must stay in the City where food and other services are available. Most of these people have run out of options. They likely have friends and relatives who are barely above water or in the same boat. Adding to their misery is the fact that the Portland Police Bureau has a serious problem with bullies in their ranks. Oppressive sweeps can leave a person devastated, and without any possessions. It is happening daily. Some move way out to the edges of town to avoid all of this, and they eat less often. Too often, police begin removing property only minutes after (24 hr.notice) postings, sometimes claiming falsely that there is some threat to public safety. The status quo — this anti-camping law — has thousands of people terribly stressed for lack of any shelter. Stressed people are more likely to get sick, to spread illness, and to commit crimes of desperation. They are less able to get or keep jobs. The camping ban is a shameful way to treat people who have no shelter options. A society which forces a homeless multitude to hide is like an arrogant mariner in the path of a hurricane, yet failing to make preparations. The suffering of thousands of our neighbors caught out in the cold and rain, will inevitably affect each of us. With record numbers of homeless people living and sleeping on the streets (increasing steadily for almost two years now), the homeless and their advocates had hoped that the City Council would have taken up the camping issue long before the start of the rainy season. The Council has continued to put the issue off, even while hundreds of complaints of cruelty by police toward the un-sheltered have piled up. The numbers of these complaints have been rising consistently (in step with the size of the homeless population) for over two years . The delay of serious discussion at City Council about the need for some legal camping has also been caused in part by an ongoing diversion of media and activists’ attention onto the ‘Sit-Lie’ issue (sidewalk obstruction). This has not always been helpful. The more crucial issue for the health of most homeless people in Portland has little to do with downtown sidewalks. Most are far more concerned with finding safe, dry places to sleep. While thousands of have remained sleepless out-of-doors nightly, the more important camping issue has systematically been given a back burner behind the old Sit-Lie issue. Proponents of relaxing the anti-camping law have been ignored for years. This latest round of delays has put camping on hold in favor of ‘Sidewalk Management’ at City Council. The Oregonian headline of October 22, “Camping Ban Up for Debate,” came out one day after the City’s new ‘Sidewalks Management Plan‘ was given careful, new force of law. The old Sit-Lie prohibition was ruled unconstitutional in June of this year. The need for legal camping has never been so great. Efforts to Ease the Camping Ban in 2008 – Why Did They Fail? For years, concerned local citizens have been asking Portland’s City Council to allow camping for the homeless people otherwise unable to obtain housing or shelter. And for years they have been ignored. In May 2008, dozens of activists camped outside of City Hall in protest of the camping ban for two weeks before arrests were made. Among the primary organizers of the 2008 City Hall protests was Art Rios. Patrick Nolen, Israel Bayer and dozens of other activists worked to collect nearly 2000 signatures in a post card campaign against both the anti-camping and sidewalk obstruction laws. These and others activists were advocating not just for camping rights, but also for increased funding for rent assistance. Rent assistance had been shown to be a more efficient use of taxpayer money than permanent supported housing or other other public spending options for addressing homelessness long-term. When arrests were made at City Hall, they were based not on any actual violence or obstruction, but on politically-generated fears that this might occur there. By June of 2008, as homeless advocates were re-organizing following those arrests, City officials were alarmed enough enough that they promised to take up the camping issue. The CCEH then assigned the responsibility of drafting “guidelines for acceptable camping” in Portland to Sisters of the Road, StreetRoots, and a couple of other reputable stakeholders. Note: “Guidelines” are the conditions of place, time, and manner needed for an efficient change in the law. Guidelines are what makes it clear to campers, the public and police what is legal and acceptable camping.. But somehow the “guidelines requirement” were consistently mis-characterized as, “putting the homeless under a microscope.” This had the effect of delaying the process because “input from the homeless themselves” was a requirement for the guidelines’ legitimacy. If only the homeless people who were supposedly “against guidelines,” had clearly been told that this was a requirement for the legislative process at City Council for the legal change that would allow some camping, they surely would have participated in the surveys to establish guidelines. But it was not explained to them correctly. This was like shooting oneself in the foot in a complicated legal / legislative process. Had the Guidelines been drafted in 2008, this could have allowed for serious consideration/ modification of the camping law by the City Council last year. Tragically for many who were forced to winter ’08 without legal shelter, the 2008 effort camping law reform fizzled out by fall, and produced basically nothing. Disagreement and delay characterized the 2008 meetings among players who are normally easy allies. There was and still is bewilderment over the lost opportunity. Later it was revealed that pressure from the Portland Business Association (PBA) and the Portland Police Bureau, and certain City Council persons were behind the killing of the effort to allow camping before the start of the 2008 rainy season. The P.B.A. has exerted huge pressure on Sisters of the Road, StreetRoots and other homeless-helping charities — in the way of donations and continuing promises of support. The P.B.A. also has a huge influence on police actions, and could be the deciding voice in whether long-established charities or other businesses are able to keep their permits, zoned status, or buildings. The Business Alliance does both good and bad in our City. But this ongoing effort to kill, water down, and/or further delay camping law reform in Portland — even while record numbers of newly homeless are suffering — is very, very bad. Serious efforts at camping ban reform were not revived until after the Oregon Law Center brought suit over the camping ban in December 2008. On the coat tails of the law suit came G.R.O.W.S.‘s humble petitioning effort in May 2009, alongside a continuing accumulation of citizen complaints about police harassment and abuse. The testimony of a dozens of others over the last year at City Council also pled the case ongoing for the human right of shelter. These developments plus the undeniable presence of more and more homeless people on the streets — all helped to revive the issue of de-criminalizing camping this year. Taking time off from gardening this spring, G.R.O.W.S. tried to increase camping discussions at City Hall by conducting a petition drive and survey. Our “Petition for Hassle Free Camping Areas” very quickly netted about 300 signatures. It was during this process that we realized that the majority of homeless nowadays are newly homeless and looking for work. We delivered copies of the Petition on June 17th to the Portland City Council, and to the City Attorney. We advised the City Council about the high risks to public health and safety posed by such a large un-sheltered population. G.R.O.W.S. suspended the petition drive when Commissioner Nick Fish and the CCEH pledged to look seriously at shelter alternatives for those without any shelter. Additionally, many of those who testified against the Sit-Lie law also begged the Council to allow some legal camping. The CCEH’s Alternatives Workgroup began meeting in July 2009. G.R.O.W.S. participated in this summer’s meetings, advocating for camping. We unsuccessfully promoted the idea of organized, larger-scale encampments on public lands (e.g. several ‘dignity villages’ with gardens). We also advocated unsuccessfully for the development of sustainable farms and other local green work-with-shelter programs. The CCEH, however, is not very focused on developing or promoting jobs programs. Fortunately, the need to camp was the consistent plea of several people at the Alternatives Workgroup table this summer, including Seattle tent cities co-founder Leo Rhodes, who is homeless. Rhodes, who sells ‘StreetRoots’ at the Trader Joe’s location in Hollywood, has consistently pointed to the tent cities of Seattle which have long-established records of good neighborly relations there. Many of Seattle’s skeptics have been won over as consistently effective self-government at the tent cities has worked to dispel local prejudices against houseless campers. Camping Guidelines: required, agreed upon conditions for legal camping. This year, the responsibility of drafting the needed Guidelines for legal camping was given by the CCEH/ Alternatives Workgroup to JOIN and Sisters of the Road (again). This was asked of them in early August, and many hoped that they could have guidelines drafted and ready as part of Commissioner Fish’s proposal before the start of the current rainy season. Sounds noble, but two months went by with little to no progress in drafting a CCEH camping proposal (early August til late September), largely as the result of this misinformation-oriented stance. Sisters of the Road representatives have continued to communicate regularly with Commissioner Amanda Fritz throughout this process. Together they openly gave first preference to the Sidewalk Management issue, as if dealing with that issue could not have happened simultaneously with the camping issue. By the putting the ‘camping rights’ issue on a back burner for months now, a thousand people today are wetter, colder, more stressed, and more disillusioned than they might have been had this (still awaited) Camping Proposal gone forward to the City Council in September. Or last year, for that matter. In this way, the powerful Portland Business Alliance has continued to be largely responsible for the continued suffering of the un-sheltered here in Portland. Again, our shelters are full — turning away hundreds nightly, and these big players are well aware of this. The persistent efforts of Marc Jolin and JOIN at the CCEH’s Alternatives Workgroup meetings were instrumental in accomplishing the drafting of the needed Guidelines (conditions of place time and manner) for acceptable camping this year. Better late than never! Were it not for Jolin’s work in this process, this year’s efforts to attain conditional camping rights for thousands without shelter might have been delayed even longer — or fizzled out like last year’s efforts. As it stands, Commissioner Nick Fish has been given a set of Guidelines, and the ball is now in his court as to the timing of a City Council proposal to allow limited camping. Beginning in September, orderly overnight protests at City Hall began again, lead by formerly homeless activist Art Rios. In compliance with the current law, campers have been sleeping there Monday through Friday without tents, using only tarps wrapped around their sleeping bags to stay mostly dry. With everyone packing up and clearing out early each morning in order to avoid upsetting City Council members, their protest has been mild compared with those of 2008. The current protesters tried to begin carrying their night time protest over into day time hours recently, but were asked to leave by the Mayor. They complied. Significantly, this year’s City Hall camping protest organizers have required all those participating to sign a ‘Code of Conduct’ requiring non-violence and respect for lawful authority. Organizers also offered a written handout to all who inquired about the protest, explaining that homeless people lack safe places to sleep where they can be free from harassment from police and private police. They have set a great example of how well small camps can govern themselves. In large part due to a “Gentleperson’s Agreement” worked out between Sisters of the Road, the CCEH and the PPB, under which police agreed to let people sleep between 9 pm and 7 am, the police have so far left the City Hall campers alone. The Portland Police Bureau (PPB) has not always been so kind to homeless campers generally, however. Reports continue to come in about abrupt 3 a.m. awakenings, and of their being forced to “move on,” even though there is no legal place for them to go within the City. Again made to move on, without many options. Police often seize and dispose of the property of homeless citizens. There is an established pattern of Police disposing homeless people’s property rather than offering them opportunities to reclaim their things as required by the law. A loophole allows this in some instances, but this consistent pattern is illegal, even if the anti-camping law is found to be legal. It indicates that there is a policy of un-Constitutional discrimination against the status of homelessness. Use of excessive force by Police against lower functioning people is an ongoing problem in Portland. The majority of Portland police officers are decent people, but there has been an ongoing, top-down tolerance (if not approval) of often vicious police behavior toward the homeless. This is evident in the long pattern of abuses. In fact there is a growing heap of evidence that we have a few mentally ill PPB officers on the Force, and yet this is apparently not even being discussed by our City Council. Hindering effective discipline for bad police behavior, the current police union contract enables protection of bullies no matter what. Sadly, too many local citizens have come to fear our own Police because of the cruelties of a handful of officers day and night. While he was doing volunteer work, this homeless man's only belongings were disposed of within an hour of the posting of Notice. No matter how balanced and helpful we might create our laws to be, injustices will still be suffered especially by poor people, as long as we have our laws being enforced by unstable, power-mongering people. Truly, we are cultivating despair and often anti-social behavior among the homeless by continuing to employ bullies to enforce our laws. A small minority of unchecked bullying officers can cause a lot of lasting harm. Cruelties are also being carried out by private security forces, which often act as though they are police. Portland Patrol, Inc. has gained an especially bad reputation for bullying, and the illegal taking of belongings from homeless people. There has been a lack of accountability for their crimes as well, with the City Attorney’s Office generally declining to pursue complaints. In any case, even the kindest of police officers are operating under a long outdated law — which has thousands of people among us unable to legally shield themselves from the wet and cold, even if in order to sleep. The CCEH Alternatives Workgroup this year placed Sisters of the Road Cafe and JOIN in charge of drafting the Guidelines needed to allow camping. They were asked to draft them in July. They were delivered to Nick Fish at the end of October. Fish now says that he “hopes” to introduce a reform proposal to the full City Council “before the end of November.’ He may or may not deliver in November, but it’s likely that Portland’s camping ban will soon be up for debate. One month and three and a half inches of rain into our rainy season, all eyes are now on the City Council. It’s great that the Portland City Council is spending millions on permanent supported housing for the homeless. Most of it is temporary federal funding. Over the last five years, the CCEH and the Housing Bureau have indeed helped thousands of homeless and “in danger of becoming homeless” people to find inexpensive housing in Portland. Others, though rent assistance programs (again mostly federal money), they have helped to stay in their apartments. And this is good. However, some serious waste and perhaps corruption has been reported in this process. For example, nearly two million dollars in funds meant for low income housing units were recently wasted in the South Waterfront development district. Still, so much has been spent that over the years, the Portland Housing Bureau (which dominates the CCEH) has steadily increased the number of “low-cost” housing units available. All of the good work of the Housing Bureau and CCEH aside, the fact is that we have a seen serious increase in the numbers of homeless. Because the number of newly homeless people has been growing so fast in this economy, the Housing Bureau/ CCEH’s high-dollar efforts are helping only a small fraction of the homeless population. Long-term planning is good, but short-term compassion is much needed today. Some camping needs to be allowed. Under the pressure of the Oregon Law Center’s class action lawsuit over the constitutionality of Portland’s camping ban, and under threat of still more law suits, and in light of an undeniably fast growing number of homeless people throughout the metro, the City Council has at last decided to take up the camping ban issue. After years of foot-dragging on the issue of camping, the Portland/ Multnomah County CCEH this summer assembled an ‘Alternatives Workgroup’ to examine temporary options to permanent supported housing. Based on the ideas of the Alternatives Workgroup, the CCEH has made a series of recommendations to Commissioner Nick Fish, who has pledged to propose some “alternatives for safe, dry places to sleep” to the full City Council in November. Some Specifics . . . Upon the recommendation of the CCEH Alternatives Workgroup, Commissioner Nick Fish is planning to propose to the City Council an “easing of the camping ban.” He is also likely to propose other options as to how homeless people can have more safe places to sleep. How the Council will vote will depend in part on how many citizens voice their opinions to them. This issue hopefully will come up by mid-November. 1. Portland would adopt a position similar to that of the city of Eugene’s safe camping program (Eugene City Code, Ch.4.816). This would allow churches, and certain private businesses (depends on how zoned) to legally allow small numbers people sleep on their property either in tents or in cars (perhaps 4 to 6 per site). The proposal may also allow private homeowners to allow camping on their properties. 2. Portland would relax enforcement of the anti-camping law to allow for tents on certain city properties during night time hours, at least during the winter months. Tents pitched on certain Multnomah County properties may also be permitted. 3. Guidelines for proper camping behavior (place, time, and manner restrictions) will be made public so that the rules are clear to campers, citizens and police. If that which is outlined above is what Commissioner Fish does propose for legal camping, it would be a step in the right direction. This proposal would, however, present some shortcomings. Other helpful changes might be proposed also. Hundreds in the Portland Metro areai – even whole familes – are now car camping. Among the good ideas which might soon be proposed at City Council is the proposal for leniency toward expired vehicle tags whenever the vehicle is clearly being used as shelter. It is very common for the unemployed and houseless to be short of money when their plate tags expire. Requesting leniency would be a very practical way to help hundreds of people for whom their car has become the last safe place to sleep and store possessions. They need a break! The costs to society of more people (upon losing their car to a tow) ending up on the street is much greater than any forgone DMV/DEQ revenue which might result from a policy of leniency. The proposal for leniency for car dwellers has been given a “maybe” by the CCEH, and it is not clear whether the County Council will discuss it. Tell them your opinion! Another good idea which was discussed but not followed up on sufficiently by the CCEH is the idea of using vacant public buildings. There are many around the City. Some have been idle for a few weeks, others for years. This idea of using vacant buildings was favored by a strong majority of stakeholders in attendance at CCEH meetings this summer. As of their public meeting of October 21, the CCEH staff claimed that they have been unable to identify and secure any vacant public buildings appropriate for temporarily sheltering local homeless citizens. More humane than merely allowing camping, this idea of utilizing mothballed public buildings to give shelter to the those nightly turned away by shelters seems unlikely to advance to City Council this fall. Use of idle public lands and buildings for the sheltering of our vulnerable neighbors is something we all have a right to demand. It would be a humane and efficient use of public resources, given the potential ‘return‘ in terms of improved health, safety, and potential productivity of the housed citizens. Note: A great resource for ideas about county and/or city sponsored work-with-shelter programs around the country is the National Association of Counties in Washington, DC. Another good idea from the CCEH Alternatives Workgroup include the development of tent cities or Dignity-Village-like encampments. Such encampments or ‘tent cities’ could be established through consent decrees between the city and a reputable charity or church. Seattle’s tent cities are remarkably efficient, and well self-governing. Tent cities would likely be the most inexpensive of all the good ideas talked about by the CCEH Alternatives Workgroup. It has been given an elusive “maybe” by the CCEH higher ups. Storage Areas for Belongings of the Homeless? One of the most difficult things about being homeless is not having any secure place to store possessions. A change of clothes, some canned food, a can opener, a few photos of loved ones, a blanket, a pillow. Leaving them to go look for work means losing them, time after time. Often it is the police who take their things, sometimes another homeless person. This is why we so often see tired people with shopping carts, and weighted down by bags. One very practical proposal put forth at the Alternatives Workgroup of the CCEH is the idea of storage space with lockable cages or boxes where homeless people can leave their belongings while they look for work, or travel to services. Among the most practical places where this could take place inexpensively is the expansive area of ODOT and city properties underneath the (mile-long) I-405 freeway onramp to the Fremont Bridge. These properties have the immediate advantage of being relatively dry and sheltered because of the massive structure. The proposal for storage areas for homeless people’s belongings was given a “maybe” by the CCEH, and seems unlikely to happen this winter. Use of Existing Outdoor ‘Dry’ Spaces? This NW 18th and Savier site was where early Dignity Village campers wintered for a a few weeks in 2001. The City made a point of fencing it off. It has also been proposed again and again that the homeless be allowed to sleep during the winter months beneath these massive on-ramp structures. These areas are non-retail, non-residential, and within a walking distance of the charitable dining halls of the City Center. Much of this stretch of dry land is either not being used, or is sadly under-used. With winter closing in, this idea was dismissed by the CCEH this fall. We are hopeful that Nick Fish will promote these left-out ideas, when modifying the camping law. Too many people are suffering. Now that the camping ban is up for debate, the question becomes whether the upcoming proposal to ease the camping ban, if passed by the City Council, will be effective in helping large numbers of un-sheltered people to have enough safe, dry places to sleep? We hope so, but questions remain. An ‘easing of the camping ban’ . . .
Will Fish’s (long awaited) Proposal Require that People Sleeping On Public Lands “Pack Up and Move On” Every Morning – Even in the Rain? We of course hope that Commissioner Fish is successful in easing the camping ban, no matter what. However, we are concerned that campers will be forced to pack up each morning — too often in the rain. Early reports are that the proposal which Fish is considering making to “allow camping on certain city properties” would require campers to pack up each morning and clear out. good time to pack it up? The problem with this idea is obviously that when it is raining, campers will get wet while packing up. And most of them will stay wet, because there is a serious lack of day warming centers. Many of these people will have no where to go to become dry. Camping on Certain City or County Properties Should Be Allowed for Longer Periods. Not everyone who is homeless is likely to find a church or a business which will allow them to camp on their property. The rest will be forced to camp on city or other public properties. Merely allowing camping overnight is a formula for keeping people wet during these rainy months. Staying wet and sleeping wet does not allow for deep sleep. Waking up shivering is hard on body and mind. Generally it only takes a few weeks of sleep deprivation before signs of mental illness can begin setting in. We must give people a chance to sleep well if they are ever going to get their lives back on track. Shouldn’t we allow people to keep their tents up – at least on certain city or county lands – if it is pouring rain in the morning? We believe that this “morning rain exception” should be part of the new camping rules. We believe that camping on church and private properties should be permitted on an ongoing basis in order for people to remain dry. It should depend on the weather. If it’s raining, let’s allow them to keep their tents up in order to stay dry. Increasingly this is a triage situation. Women and children, the battered and abused, the elderly and people with disabilities could more easily be given first priority at the official shelters (now beyond capacity) which offer basic services. Note: this would be likely a side effect (though not necessarily the intention) of legalizing some camping. An easing of the camping ban could allow more healthy adults to sleep safely out-of-doors, freeing up precious few official shelter spaces and resources for those more vulnerable. A triage approach is inevitable with such large numbers of vulnerable citizens un-sheltered. Local Churches and Charities Can Play a Simple, Key Role. The City Council proposal will specifically allow churches to permit camping on their property, including parking in their lots. Hundreds in Portland now living/ sleeping in their cars are technically “camping illegally.” This proposal will likely allow a small number of campers per church. Church lead efforts in Seattle, and across the U.S. where limited camping is allowed, have made a big difference in this effort to get people out of the rain. A church may choose to take campers under wing — helping them with basic needs, employment, etc., or could simply allow them to camp with no amenities offered. Either way, it would be a great kindness for the homeless. Many first time homeless lack tents. Many have had their tents taken by police. Donation drives are needed for tents and other camping equipment for individuals as well as families. Facilitating low-cost camping would be a major help, and a key role which churches play in giving comfort to those otherwise un-sheltered. The fact is, our local governments — as much as they may spend on rent vouchers and shelters — are likely not going to buy or collect tents or other practical camping equipment for the homeless. Drawbacks of the Fish Proposal: only a few campers per church. Because the proposal of Commissioner Fish to the City Council will likely be to allow only “a few” car or tent campers (perhaps 3 or 4) per church site, MANY more churches will need to get involved in order to help even a fraction of those currently experiencing homelessness. The numbers of un-sheltered are in the thousands locally. Coordination among the churches will therefore be very important. Which begs the question, why has there not yet been a larger, more vocal council of churches in Multnomah County? Washington County churches have come together for ‘summits’ twice in the last two years. Through their increased coordination, they have greatly increased the help they provide. It is unclear whether and when the churches of Portland’s east side will form such a broad working group on homelessness issues. It does not appear to be about to happen any time soon. This is an unfortunate position to have taken. A lot of preventable suffering can happen between now and the spring. The churches of Portland’s east and north neighborhoods would serve Christ well to organize a summit(s) around homelessness issues sooner rather than later. Perhaps it would be best to do so without the government being involved in organizing it. The need for improved coordination among the churches is immediate and serious. A summit would help improved coordination to happen sooner. There is currently an effort to expand the Multnomah County Day Break Shelter Network. Helping whole families to come indoors and be helped with basic needs, the Day Break system is yet in need of participation by more churches to be more effective. County Commissioner Deborah Kafoury is currently championing an effort to bring more churches on board. Ms. Kafoury recently wrote to Joe Anybody’s Blog about this effort. Quietly, some Portland churches are already allowing people (unofficially) to camp on their grounds. The rain has increased suffering greatly. 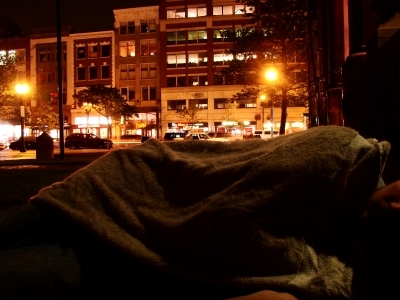 Allowing tents and cars on church grounds could alleviate a lot of suffering each night. Some churches have received many requests to camp on church property, others have received none. Better coordination is still needed to maximize the role churches in Portland can play. Will enough church leaders make efforts to coordinate limited camping in their empty side yards and parking lots – for those otherwise un-sheltered? Please let’s strive for treasure in heaven in this way. If each church that could do so – would do so, we’d go a long way toward protecting public health and public safety, and fulfill the promise of Matthew 25:40 in our own congregations. As you know, the First Amendment to the U.S. Constitution protects churches’ rights to worship free from interference from government. There is also a specific federal law called RLIUPA, which stands for the Religious Land Use and Institutionalized Persons Act. Passed in 2000, this law is intended to protect the rights of people who want to use their property for religious purposes when zoning laws would prevent such uses. Hopefully in November, the City Council will likely make it possible in Portland for churches, certain businesses (depends on how zoned), and possibly private residence owners to allow camping on their property. This is good news! There are yet a whole lot of if’s, maybe’s, and uncertainties about the relief steps being proposed at City Hall, including the new camping proposal. If the proposed steps do not effectively alleviate the suffering of enough un-sheltered people, then we believe that the Mayor should declare a public emergency. It need not be the Red Cross, but more warming shelters are badly needed. This would allow for County, State and maybe federal resources to become more readily available, and would remove bureaucratic hurdles to allow quicker contracting and implementation of emergency relief plans. The Portland law concerning emergency declarations and powers can be seen here at PortlandOnline.com. The economy has become a disaster for a quarter million unemployed Oregonians, and is already an (officially undeclared) emergency for thousands among us. If an emergency were declared, we would then see quick, economical, large-scale help for thousands otherwise languishing. Right away we could see efficient services delivery, immediate availability of shelter tents otherwise sitting mothballed, and the building of basic pavilions (or large tents) with utilities that could be used in common among campers. Red Cross, national guard and other volunteers could be organized, just as when there are natural disasters. State and federal disaster assistance funding might also be made available. Sound extreme? Wake up! 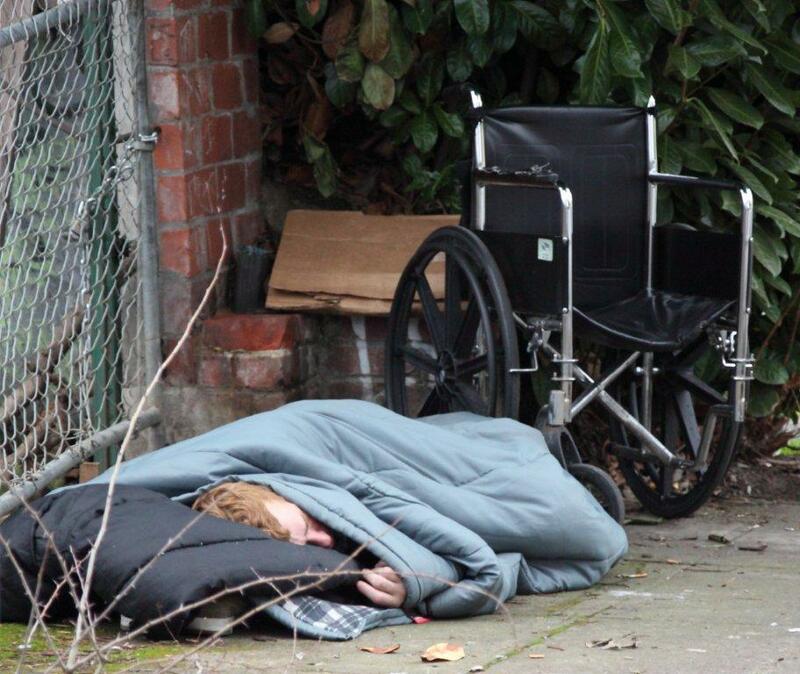 Oregon is NUMBER ONE in the U.S. in per capita homelessness. If any state would qualify for disaster relief, ours would. This is unprecedented suffering among us here, and this is called for. We believe that we are already in the midst of an undeclared public emergency in the Portland metro. Whatever the cost of emergency response, it will bare a good return in terms of protecting public health and safety. Remember in the news last year – when the house in an affluent west side neighborhood slid down a hillside? The City of Portland was quick to declare an official Emergency. That did indeed allow for a faster, more effective response – it’s true. Can’t blame them for wanting that. Apparently though, thousands of poor people out in the rain day and night just don’t matter as much as a few expensive houses to our City government. Declaring an emergency streamlines otherwise time-consuming procedures in city contracting and other laws, allows for rapid response, and makes it easier to get help from the County and the State. It is also a very ‘high profile‘ thing to do — not likely to immediately attract more foreign business investment. 3. The Mayor or other City official, as provided in Portland City Code Section 15.08.010, has declared that a state of emergency or disaster exists by proclamation. B. “Disaster” means an occurrence or threat of imminent widespread or severe damage, injury, or loss of life or property regardless of cause which in the determination of the Mayor or designated public official, causes or will cause significant damage as to warrant disaster assistance from outside City resources to supplement the efforts and available resources of the City to alleviate the damage, loss, hardship or suffering caused. An emergency can be declared for many conceivable reasons. As described above, we’re already in the midst of a situation which cries out for an emergency declaration and disaster relief. Sam Adams and other City government government officials have the power to make an emergency declaration for the sake of thousands without shelter. So far, they have chosen not to do so. Declaring an emergency would perhaps stain the reputation of Portland as “The Jewel of the Pacific Rim.” It might make our City leaders look bad in the eyes of the nation. Or maybe Sam does not want to go out on a limb and be the first U.S. mayor to do so for the sake of something so “economic.” Given the numbers of un-sheltered people locally, and the growing threats to public health and safety, it would be a wise and courageous thing to do. We believe that a court of proper jurisdiction, if presented with enough chilling evidence, would issue a writ of mandamus ordering the Mayor to declare an emergency. If not so granted, why shouldn’t we begin looking to the County, or to the State, or to FEMA, or to the United Nations High Commissioner for Refugees? Sound extreme? Conditions on the ground do indeed call for such measures. Recently a United Nations official toured the U.S., and concluded that the official policies of our governments toward the the homeless are cruel. In forcing them to hide, and by hiding the problem, the problem grows worse, says Raquel Rolnik, Special UN investigator for housing issues. Interestingly, the U.N.’s findings were released on November 9, yet had apparently not been reported on by any of the five largest U.S. media companies as of Nov. 13th. Yes, Portland is getting to be a candidate for FEMA or U.N. relief. But of course, local solutions would be best. This is a crisis that the City of Portland and Multnomah County, in cooperation with other area cities and counties, with State help, can take care of locally. We just need the political will to do so. Public health and public safety are increasingly at risk. Their suffering will somehow affect the well being of each of us. It is in the public interest that we facilitate development of emergency camps — or at least to allow them to pitch their own tents this winter. Since most of these newly homeless are “ready-to-work” people, the cost of camps need not be as high. They can be asked to help build and maintain their own camps. Most would gladly participate if it meant food and shelter. What Will it Take for Our Leaders to recognize the Unfolding Emergency? A lingering pandemic, or what? If there were a natural disaster locally, say a major earthquake, which suddenly threw 10,000 people in the Portland Metro area out of their homes, we would know that this was a public emergency. The Mayor and the Governor would both quickly declare it as such, and reach out for organized disaster relief assistance on a large scale. Yet when as many people are turned out of their homes and apartments over the course of two years by the worst economic downturn since the Depression, our Mayor and his business-as-usual colleagues tout their past accomplishments, and direct those who complain that more effective measures are needed to Commissioner Nick Fish and the Coordinating Committee to End Homelessness (CCEH). This is like a prescribing a band-aid for a gushing arterial wound. Or more aptly, it’s like recommending a team and a game plan which is capable of slowly helping hundreds of people — at a time when immediately helping thousands of un-sheltered people is what is badly needed. This is clearly incorrect. But whatever. This kind of run-around (and deflection of responsibility) is standard operating procedure for the Council when it comes to the growing local disaster of epidemic homelessness. They all like to keep saying it’s Nick Fish’s and the CCEH’s problem. We believe strongly that, as things are, the CCEH is not in fact the right tool or agency for creating ground-up economic development (e.g. sustainable county farms with shelter). We have tried. The CCEH so far does not seem interested in work and training programs generally — even for the sake of promoting self-support, which is therapeutic. The CCEH is also not inclined to developing lower-cost, larger-scale shelter programs — which is unfortunate since lower cost options are needed if we are to afford helping thousands of people quickly. So we have begun hoping that the County is awake enough to know how badly this approach is needed. We Need Locally-Initiated, Ground-Up Economic Development. Why not employ more public resources locally to jump start ground-up economic development — by developing programs which help the un-sheltered to take care of themselves in working communities. Use public buildings for this, and public lands! Free up moth-balled state, county and city property — there are plenty of resources, if not actual funds (yet). We keep reading comments posted in various local newspapers and on Blogs which have been sent in by cold-hearted people who insist in broad generalities that, “the homeless are all outside by choice,” or “because of their bad choices, or “they should get jobs.” Uneducated, superior-minded commentators like to have easy excuses for inaction, or worse, they like to kick a person when they’re down. Again, there are record numbers of homeless among us now, and Oregon has a higher percentage of homeless than any other state. MOST of them today are working class, high functioning, honest people. There are just too few jobs. Homelessness is up by 70% over last two years in most Oregon counties. We are told to expect a jobless recovery, so how can we expect this situation to improve without some ground-up economic development? We need the old fashioned, public works-focused, labor intensive kind of economic development. If the federal government won’t do it, we can do it ourselves locally. Please check out our Blog Post here entitled, “As Economy Worsens, County-Administered Poor Farms… Again a Good Idea.” It’s our Septmeber Archive. “Poor farms” is an outdated term, we know. But historically, this is how civilized people have usually managed to help un-sheltered and hungry masses during lean times. Throughout U.S. history up until the 1950’s, LOCAL governments allowed people to simply subsist on idle public lands (and to be self-governing to the extent they are able). This is what has worked. The Farm at Long Island Shelter is a successful government supported work-plus-shelter program in the Boston area. Modernly, there are many economical, green ‘work-with-shelter communities‘ already operating successfully in the U.S. Though many model programs have been pointed out to the CCEH, none that we know of are yet under serious consideration by Commissioner Nick Fish’s Office or the Portland City Council. Please write to them and demand that the City consider developing efficient, compassionate ‘work-with-shelter’ programs. Back to the camping issue immediately at hand . . .
Another ‘Dignity Village’ Is a Good Idea. Several Better-Run Encampments Would Be Even Better. Imagine a Dignity Village with a work shop, a garden, and a decent central kitchen/bath/laundry facility. Additionally, imagine a vocational training emphasis, part time work, an income stream, and reduced dependency on donations. Imagine the pride among them as they work toward greater self-support. Now imagine several such well-governed communities. It is legally possible for the City of Portland to immediately establish an additional “transitional housing” community. See, ORS Chapter 446.265 (5). The public costs of housing people at Dignity Village is actually much lower than the cost of housing them through the traditional “permanent supported housing” approach (e.g., TPI or Central City Concern apartments). For example, the City of Portland and Multnomah County could designate an emergency campground on the 44 (+) acres of good public land which surrounds the new CROPS Program acreage near Troutdale. If well organized, this ground could accommodate perhaps 200 people. The County/City could go on to allow well-organized campers to farm and to have a workshop on site. Properly supervised, they could help build their own simple shelters. Some part time effort toward self-support wold help people’s self-esteem, while keeping down the costs of such an endeavor. Once given shelter, they could be trained for local public works projects — forming mobile crews for landscaping or invasive species removal, etc. They could be trained to operate a small business. Many homeless people would be glad to help support themselves and their families by working part time for room, board, and even just occasional stipends. Facilitating self-support on public lands would be affordable even on our limited local budgets. Many other Multnomah County and/or City parcels of land could also be suitable as an emergency campgrounds. Proximity to mass transit would be needed. We believe that local governments should treat the situation like the disaster that it is, and begin providing disaster-relief type services. Then add work and training opportunities as you go, and we’ll see some real progress. While we in the U.S. spend half a trillion dollars a year on weapons systems, can we not find enough money locally to set up basic camps for our our own fellow citizens? Use of local public lands and resources would make this possible, with or without much federal money. As the economy moves toward a jobless recovery, and as homeless advocates and government officials in Portland admit that there are not nearly enough jobs or shelter spaces, we need to at least allow people to camp. This, locally, is among the most important human rights issues of our time. The Portland City Council will soon begin debating the question of whether to set aside enforcement of the anti-camping law. Around the country, record numbers of newly homeless people are asking for work and shelter. Most advocates agree it’s about time we allowed the 10,000 (+) homeless people out in the rain in the Portland metro to at least have the legal option of being able to pitch tents. Hopefully, other cities in the Metro area will follow Portland’s lead by relaxing their own camping laws — for the sake of their local homeless neighbors. Be yourself and TELL them how you feel. Please encourage them to think about the dangers of keeping homelessness hidden. Insist on a new policy that allows people to camp, and to stay dry every morning. Encourage them to allow ongoing camping in as many out-of-the-way places as are needed for the huge number of people outside. Encourage them to cooperate at all levels of government toward (re)building a local social safety net. Tell them you’re a registered voter. And most of all, don’t tell them “GROWS sent you,” ‘cuz they really can’t stand us for telling you the truth about now. TRYING TO FURTHER THIS CONVERSATION in PORTLAND . . .
“The homeless population in the Portland metro area has reached 10,000. At least 20,000 more are ‘couch surfing’ or living temporarily with friends or family. This is a public emergency as yet undeclared. Most of these are stressed out people who are looking for jobs and shelter that aren’t there. Effective action by the City Council is badly overdue. With these kinds of numbers at hand, the City Council is beginning to listen to the cries of those who’ve long been asking that un-sheltered citizens be allowed to camp. The Council will debate the issues of camping in early November. If any member of the Council causes a delay longer than the 18th, it’s because they’re doing the bidding of their big-money corporate sponsors rather than what is best for public health and safety. Note: Since the CCEH (i.e. Commissioner Nick Fish) has removed the Recommendations of the Alternatives Workgroup from their Portlandonline.com website, G.R.O.W.S. will be happy to send a copy of that Report to anyone who e-mails us.